This was one of those books that I knew I would read, and knew I would like. If only I could get around to reading it. A year later (and I even reccommended it, without reading it, to someone else and he read it before I did), I finally brought it home and cracked it open. Then We Came To The End isn’t as much of a story as it is an experience. An ad agency in Chicago is suffering. Lay offs are rumored, then lay offs are happening, and then everyone starts to melt down. Office gossip and politics are mixed with a hint of Pahlaniuk-like madness – anyone can become unhinged, everyone could be unhinged and you might not even know it. Joshua Ferris used the unique first person plural POV (have I even read another book like this? ), which creates this weird communal tone that made me immediately think of my own job, or any job. You really do assume this personality at a job where you are just a cog in a machine, everyone working toward a common goal. When you’re in the machine, everything in your immediate consciousness is a problem – how to get books to fit on the shelf that’s too small, where to get the cheapest popcorn, who was supposed to put up the bulletin board this month and forgot – but from the outside, everyone’s doing their small part to keep the company/library/business running. 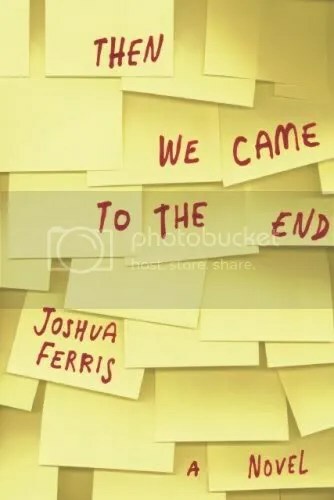 And while Joshua Ferris definitely includes the day-to-day office dealings that range from hilarious to heartbreaking, he really captures that altruism we forget about when we’re sitting at a desk. Buy this for: your uncle who loves to talk crap about his boss at family dinners, your cubicle-mate, or anyone who cracks up at the phrase “Bears. Beets. Battlestar Galactica.